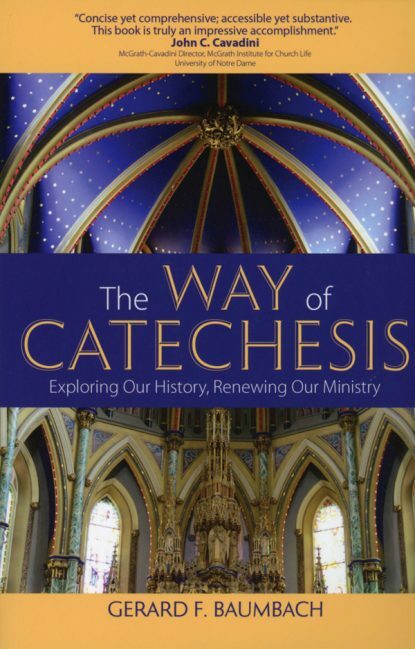 “The Way of Catechesis: Exploring Our History, Renewing Our Ministry” by Gerard F. Baumbach. Ave Maria Press (Notre Dame, Indiana, 2017). 299 pp., $27.95. In Luke 24:13-35, we find two of Jesus’ disciples walking along the road, downcast following Jesus’ death. They are soon joined by a stranger who proceeds to explain to them everything in the Scriptures. This story came to mind while reading Gerard F. Baumbach’s “The Way of Catechesis” because in little more than 200 pages (the rest are footnotes and indexes), he explains the history of catechesis starting with the Old Testament through to the present day. A mystic and poet, Baumbach writes in a style that is easy to read and understand, and makes simple that which is often dense and obtuse. Who would have thought a book describing the history of catechesis — what we often refer to as religious instruction or religious ed — could be a guide for spiritual reflection or bring forth poetic images, but Baumbach does just this. There are places in the early chapters where he seems to be writing a reflection on the spiritual journey (his own and ours) more than it does a history, so much so that one is reminded of the book “Zen and the Art of Motorcycle Maintenance,” where so much more underlies the simple story being told. The book is strongest in the early chapters when Baumbach delves deeply into the Scriptures and early church history. There he takes his sources and weaves a delightful story about how faith is shared. Once he arrives at the Reformation until today his task becomes much more difficult: he tries to cover a tremendous amount of information in relatively few pages. Where in the early chapters he might take two or three pages to address an important issue, in the last two chapters very important issues are lucky to get two or three paragraphs. This is especially true in the last chapter, where it seems he didn’t want to offend any group or scholar by omitting them. This is a case where Baumbach would have been well served to have limited the scope of his study. The least helpful part of the book are the questions asked at the end of each chapter. While they are called “reflection questions,” they generally don’t lead one to deeper thought. They will be helpful when used in a class to explore what has been learned, but not so much for the general reader. In addition, Baumbach struggles with how to refer to the writers he quotes. Some are simply mentioned by name, some are described as biblical or liturgical scholars (or the like), while others are called “renowned” or “distinguished.” Describing the field of study is helpful, the other modifiers are not. No question, this is a serious book on catechesis (with 72 pages of footnotes!) and one that deserves to find a home on the desk of anyone the least bit interested in catechesis. It will surely become the textbook of choice for college-level catechetical courses wherever they are offered. One can only hope that it finds the audience that it so richly deserves.